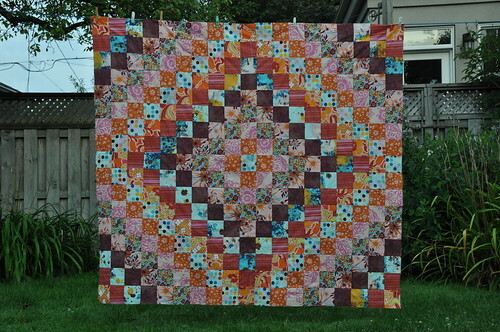 I have come down to the wire on this quilt, but I am beyond thrilled to report that it is finished at last. 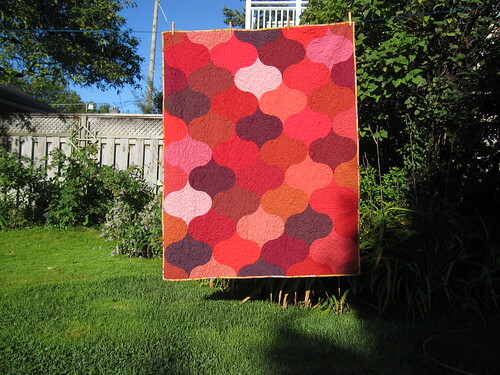 I was asked to make this quilt by a friend, whose only only child goes off to university this fall. With just under one week before the recipient of this quilt scoots off to university, I have finally completed the ogee quilt version 2. 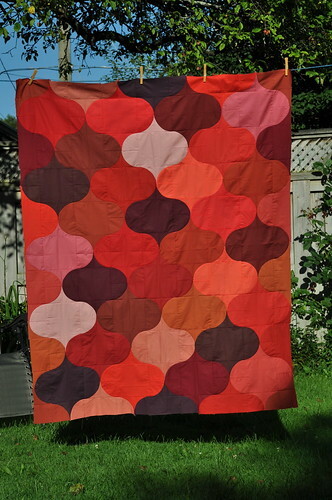 To recap the details for this one, it finishes at 48" x 60", and I made it using a Kona cottons FQ bundle in the Hot Spice colourway, using Rebecca Johnston's pattern available here. The batting is bamboo, my favourite, except for the way it leaves fuzzballs on the quilt after washing. This time I used a dog hair removal device to whisk those fuzzballs off quickly and effectively. 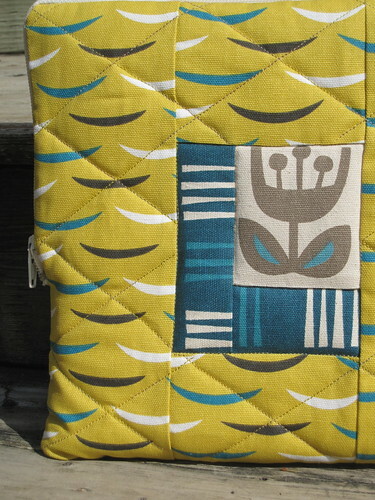 I used a King Tut variegated thread for the quilting. For the label, I used one of those Printed Treasures sheets and my ink jet printer to create a little message for the girl from her mother. 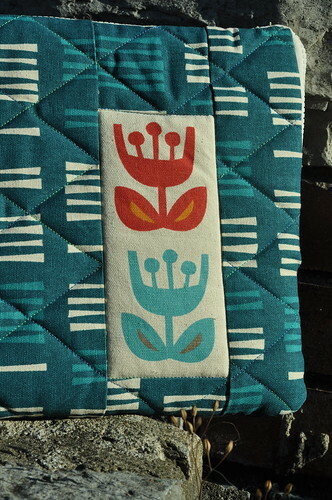 I also pieced in one of those Echino linen birds. I didn't think of it at the time, but that little bird is the one that has flown, leaving behind the empty nest. 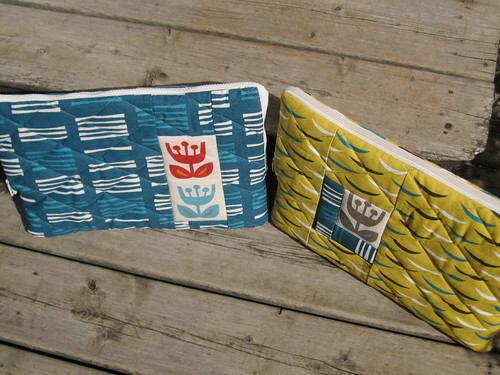 And for the backing, I used a Kaffe Fasset print. I can't believe I forgot to get a photo of the back! But here is a shot of the label that shows the print around the edges. 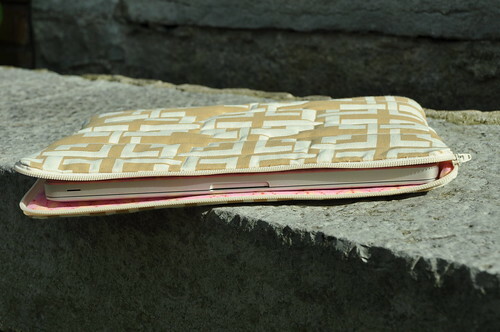 I used the same print for the binding. The photos here were mostly taken in the sun, and the colours look really electrifying. They are a bit more sober, but still rich, when they are in regular or shaded lighting. I'm so happy to be able to hand this quilt off to my friend so that she can know her daughter will be warm and cozy with a quilt in her residence room. I told her I would take no commission but a donation to the Heart and Stroke Foundation would be gratefully accepted. She surprised me with a $50 gift certificate to my LQS - that is also gratefully accepted! Events of the spring really slowed me down on the quiltalong - and I did not provide very good leadership as a result. 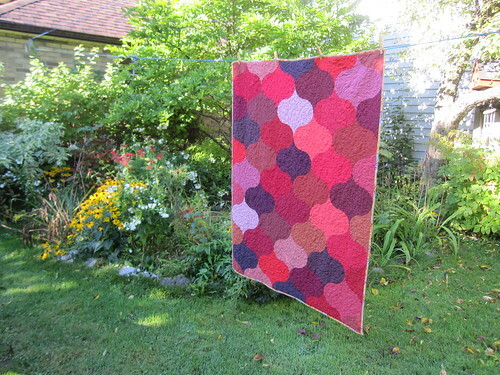 But I made it in the end, and I do encourage all of you who have this quilt on your design boards to finish it up - you will be so happy you did - it is a stunning pattern and makes a glorious quilt! 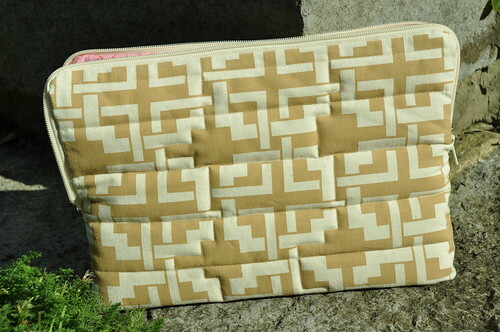 Counting the practice one, I've now made three of these laptop sleeves in the last couple of weeks. I am officially tired of making them, but, boy, do I ever LOVE these two little beauties. Here are the two of them, side by side. I showed closer and more detailed photos of the blue one a few days ago - you can go here to see them. 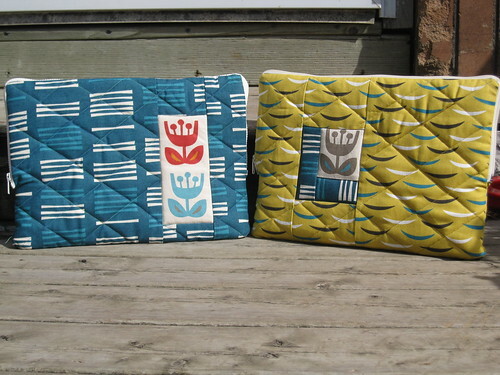 For the yellow one, I used the same tutorial, same double thickness of wool batting and the same quilting motif of diagonal lines. I also used Folksy Flannel again for a soft, protective lining. I must say, I adore that Outside Oslo line - there is a grey colourway that I didn't buy much of and I'm kicking myself. I still have quite a bit, plus some other prints that I didn't use here, but I think I'll have to dip into the online shops again soon. One last look of the two of them together. Which one do you like best? 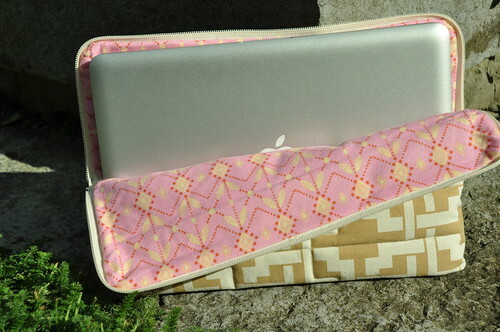 Last week I showed the laptop sleeve prototype that I was trying out, in response to my daughter's request that I make her something to keep her shiny new laptop from getting scratched in her backpack. I was beyond thrilled that she asked me to make her one, rather than going out and buying something shiny. 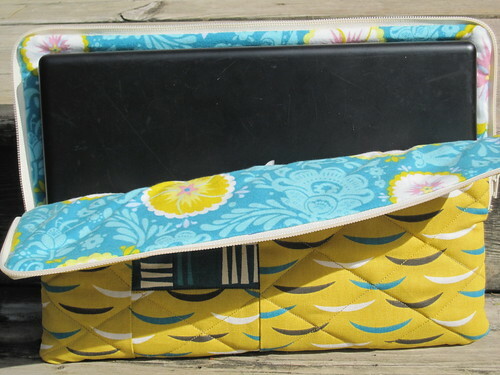 I found this tutorial online - I like that it had the long zipper that opened the top fully and made it easy to slide the computer in and out. Here's the tester - it's fine, but nothing special. She approved the design of the test run, and after looking through all my home dec fabric, she chose the Picket print from Outside Oslo as the main fabric, and left it to me to jazz it up a bit. I cut a swatch from another print from the same line and pieced a couple of flowers into the front. I quilted diagonal lines two inches apart, marked with the Hera marker, but I left the flowers unquilted. 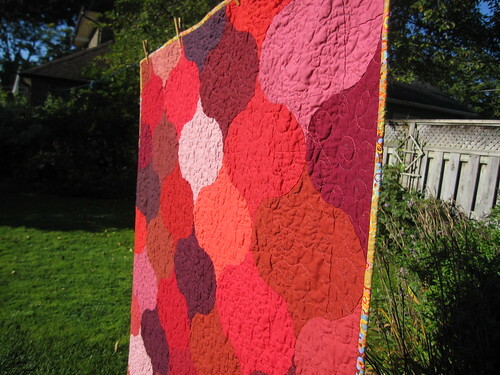 Because of the two layers of wool, the quilting has super definition, and the flower detail pops right up. I did it the same way I made the trial sleeve and, again, I lined it with Anna Maria Horner flannel. I love the gold against that deep teal colour. It met with unreserved approval and admiration. And I'm not done yet - when her friend, Montana, saw the tester, she asked if I would make her one, too! I must say, it's great when the younger set think you're doing cool stuff! I have dogs and I have quilts. That means I'm a natural for the Pets On Quilts Show hosted by SewCalGal. This is Susie. 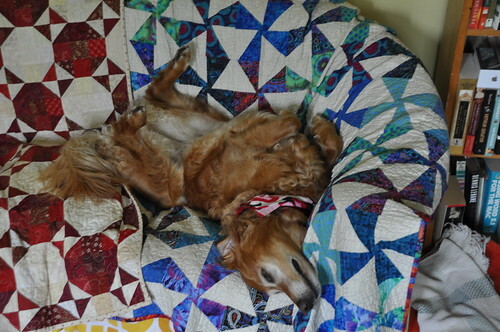 She is the elder of our two golden retrievers, at nine years old. She loves to sleep on her back like this - she spend most afternoons with her feet in her air, and often with her head hanging down off the sofa. Whoever said it was a dog's life didn't know my dogs. Susie is very sociable and she smiles and shows her teeth in greeting. It is bit off-putting for people who don't know her, but she is truly smiling. She often wakes me in the morning by jumping onto the bed on my chest and smiling into my face - I have become inured to waking to a full-on view of flashing choppers. And, for the sake of equity, I'm going to post this photo of Darla. It's an older photo, and I meant to enter into SewCalGal's pet/quilt show last year, but I wasn't organized enough to do it in time. Darla is seven. Look at that face - you'd never know she is a murderess. Several squirrels are wearing halos and playing harps right now, thanks to Darla. 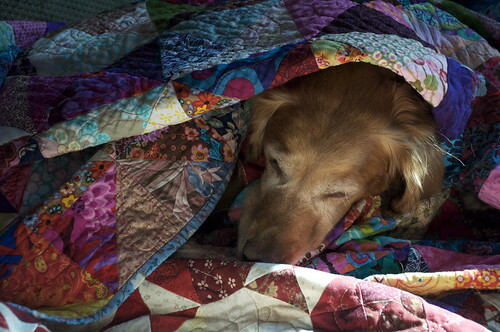 Entries to the Pets on Quilts Show are accepted until the 19th. Click on this button to take you there! Edited to add these videos of Susie and Darla. This first one is of Susie getting her ears tickled, which she dearly loves - it makes her smile big time! I just uploaded this video of Darla, but it is actually a few years old. We found a homeless, young cat walking down the middle of our busy street - he was about 6 months old, and, as it turned out, deaf as a post. We loved this little guy, because he fit right in with us, and he loved, loved, loved our two dogs. He got on especially well with Darla, who was about four at the time. Alas, I am terribly, debilitatingly allergic to cats, so we had to find him a new home. They played like this nonstop for the three weeks he was in our house.ploaded it, but it is a few years old. We found a homeless, young cat walking down the middle of our busy street - he was about 6 months old, and, as it turned out, deaf as a post. We loved this little guy, because he fit right in with us, and he loved, loved, loved our two dogs. He got on especially well with Darla, who was about four at the time. Alas, I am terribly, debilitatingly allergic to cats, so we had to find him a new home. They played like this nonstop for the three weeks he was in our house. Did you know there are 21,300,000 quilters in America? 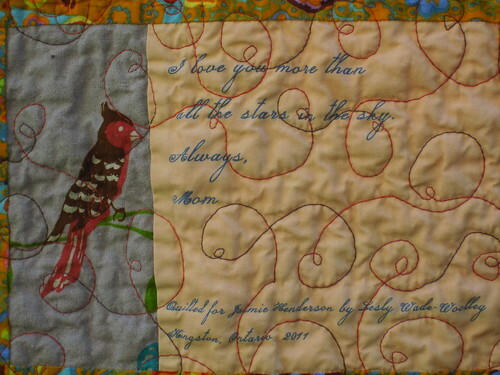 I learned this from watching the trailer for a nine-part documentary on quilts and quilting that is showing on PBS this fall, called Why Quilts Matter: History, Art and Politics. The producer of the film says You can’t run out of ways that quilts reveal American history, and this documentary will show some of those ways. I was very moved by a quote from this trailer - it certainly resonates with me: We as human beings have a lifelong love affair with cloth – this is what we’re swathed in from birth – it’s the last thing we feel when we pass away. We cannot get away from the fabric – we can’t get away from the cloth. I certainly hope my local PBS shows this series! Watch the trailer below - I'm sure you'll be wanting to see the whole thing, too! "Why Quilts Matter: History, Art & Politics" - Independent Production from The Kentucky Quilt Project, Inc. from The Kentucky Quilt Project, Inc. on Vimeo. My daughter just got a new laptop to take to university. It's a very pretty MacBook Pro, with an elegant brushed metal case. In the effort to keep it nice and pristine, she asked me to make her a sleeve for it, so that she could carry it in her backpack without it getting scratched up. I was thrilled to be asked, although I wasn't exactly sure how to go about it. She said she didn't want velcro, so that meant a zipper. Even though I've made all these little pouches, I quailed at the thought. I went online and read many tutorials. Eventually I picked this one to try. And here's what I came up with. It has a heavy cotton home dec outer layer, and two layers of wool batting for extra puff, although I only did minimal quilting on it since it's just a tester. I lined it with flannel. When I went to source a zipper for it, I saw three grades of zippers - from the most delicate for use in apparel to some with really heavy duty teeth. I chose one in the middle. 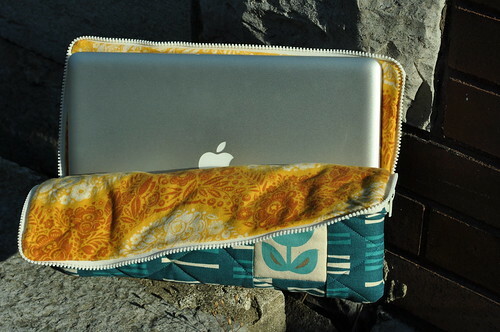 The zipper goes around both sides on the top of the sleeve so that it opens wide enough to easily slip the laptop inside. Now that I know how to do it, I'll make her the one she wants - she's laid dibs on some of my Outside Oslo home dec fabric. It's very nice to be asked to make things for my oh-so-discriminating daughter! I am astonished at how quickly this went together. The whole top from cutting to piecing went together in two after-dinner sessions. Wow! And it's a great stash-buster, too! The colours aren't as vibrant in this photo as they are in the ones from yesterday, but this is due to the leaden, overcast sky. I pinned this up to the line before breakfast, just to make sure I got a snap of it before the imminent downpour. 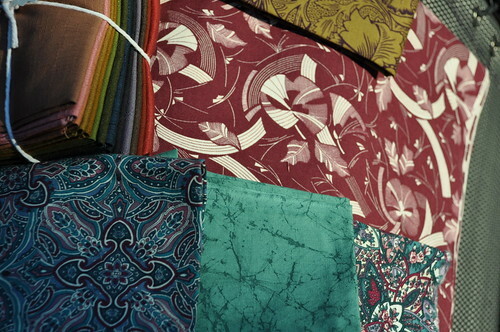 Remember yesterday, when I said I wasn't so sure about the colours of the fabrics I chose - they are growing on me. It is a low-contrast Kaffe-like composition, just as I intended, so I am warming up to it. I forgot to measure it, but each square is 3.5" finished, so that makes it about 65" square, more or less. 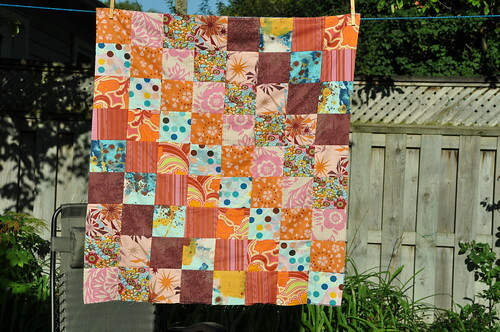 Again, I used Bonnie Hunter's tutorial for this quilt top, and I recommend it if you are interested in making a TATW. 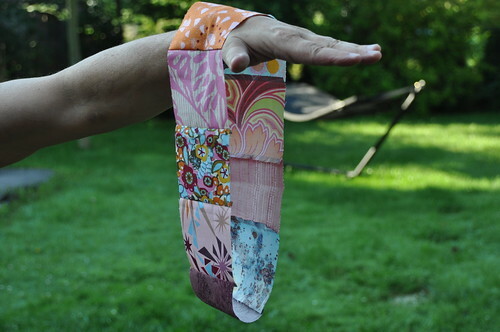 I will definitely make this again - probably using my precious stash of Marcia Derse fabrics. And about the 18 years referenced in the title of this post: We are celebrating my daughter's 18th birthday this week. I am astonished at how fast these years have flown by. From a tiny baby, under 6 lbs, she has grown into a gorgeous young woman, poised, confident and kind. She is smart, funny, and loyal. The three of us have always been a close family, with no teenage trauma - I have heard some parents say that the internal squabbling gets so bad that you are relieved when they finally leave the nest. That's not the case with us. 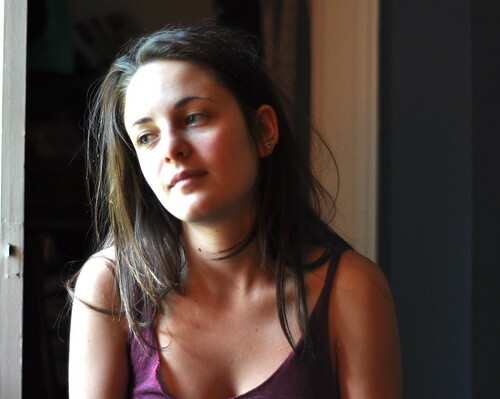 In three weeks we will be taking her to McGill to begin university - my husband and I have been like deer in the headlights for the last month. However will we redefine ourselves without her? 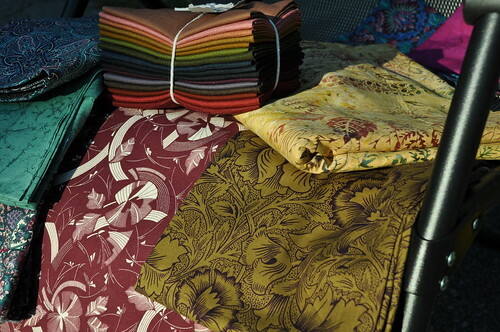 I, for one, will be making lots of quilts! In fact, I remember 18 years ago, getting larger and larger, trying to finish up some quilting projects before my due date - that was the last of my quilting for 15 years. 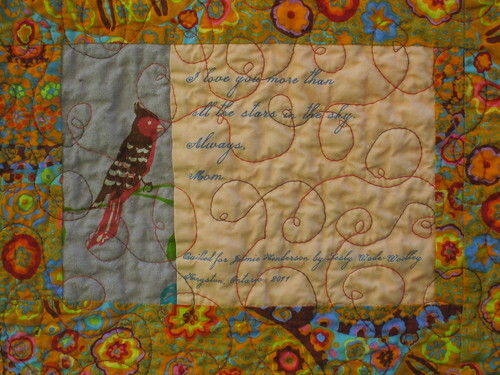 It is somehow very satisfying that I have taken it up again as she begins to leave the nest - it reminds me that the world is round, just like my quilt. Happy birthday, dearest Daughter - you will always be my sweet Munkus, my baby girl. 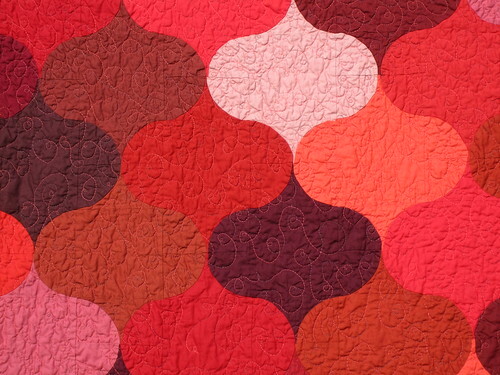 The TATW is a very common quilt (see here for some great images). 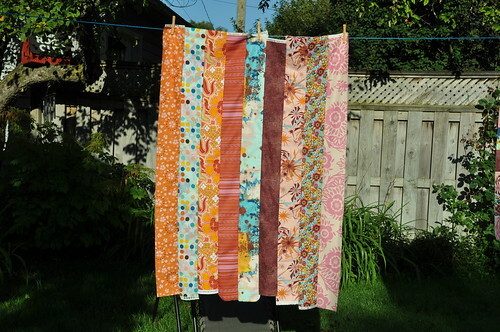 I knew that Bonnie Hunter's tutorial uses the strip piecing method that is also used in making bargello quilts. Back in the days before motherhood, I made a couple of pieces using that method and I remember it goes pretty fast. So I decided to use Bonnie's tutorial - it's very well laid out and I recommend it if you want to make a TATW yourself. I took some photos of some of the steps. 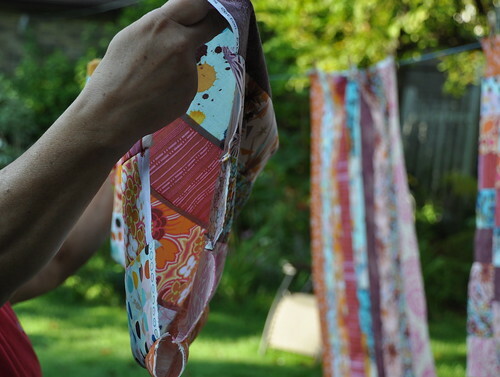 You start by cutting strips from your chosen fabrics and sewing them into strata. You have to make four strata exactly alike. Then you sew the long sides of each strata together to make a tube of sorts. It's actually kind of hard to take a good photo of the tube; here is my husband doing his best, bless his heart. Then you slice the strata into sections so that you have eight loops. Next, you unpick one line of stitches from the first loop to make a strip again. From the second loop, you unpick the line of stitches that will allow you to make a step-down of the squares. For example, in the photo below, the first loop I used appears on the left hand side, with the orange square on top of the resulting strip. When I unpicked the second loop, I made sure to unpick the stitches that would allow the orange square to become the second square from the top (and I unpicked the third strip to allow the orange square to be the third square from the top, etc.). Does that make sense? When all eight loops are unpicked and the strips are lined up nicely, sew them together to make a panel like the one below. That's one panel out of four. 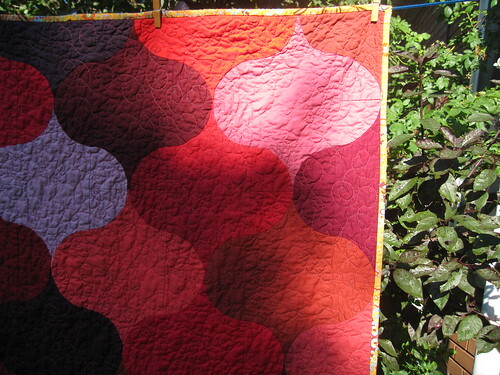 The one in the photo below will be the top right quadrant of the quilt. This was seriously fast. I did all the cutting, strata sewing, as well as the cutting, unpicking and piecing for the one panel above last night after dinner. The only drawback is that I am not 100% sold on the fabric I pulled - while I was going for a relatively low-contrast look, I am afraid it is too low and the colours look too jumbled. I am keeping my fingers crossed that it comes together once all the panels are pieced and assembled. With luck that will be this weekend! P.S. As it happens, I also read this post on TATW this morning! TATW love is in the air! Who you calling Fuddy Duddy? Over the past month I have been participating in Talkin' Tuesdays with a bunch of other quilty folk over on Twitter. It is hard to describe, but it feels like being in a large gymnasium with about 30 other people, trying to carry on multiple conversations, with everybody talking at once. It happens very fast, with topics changing quickly, and often with no good idea of who you are talking to. It's a bit of a madhouse, quite frankly, but oodles of fun. Cara moderates it, and she always has several questions for folks to respond to. One question, a few weeks ago, had to do with quilting trends and how they influence what we do and what we like. Most of us like to think we are immune to trends, but probably we aren't. Our current fascination with bright, saturated colours is a trend, isn't it? Through the madness of the conversation, we debated whether anything could be done to rehabilitate the colours burgundy, brown and dark green; these appear to be the most shunned colours among modern quilters today - I regularly see Flickr posts where people are listing their likes and don't likes, and these colours are often mentioned in the latter. Because I experience senior moments on a regular schedule, I don't recall everyone who was part of that particular conversation. But in her inimitable fashion, Cheryl offered it up as the Fuddy is Not Duddy Challenge, and Barb, Thomas, Susanne and I took up the gauntlet. The specs of the challenge are to create a doll quilt using green, burgundy and brown and only one neutral of our choice, by Canadian Thanksgiving, which is October 10. The goal is to create a piece that uses these colours, but still looks modern and exciting. The doll quilt size means I don't have to invest much money in new fabric for this challenge. 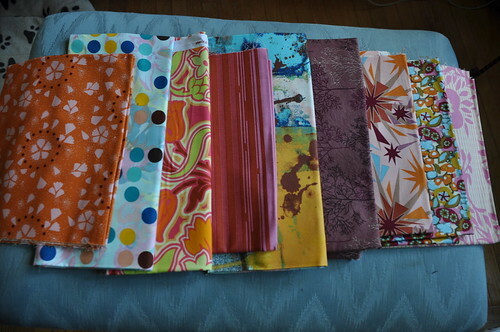 I pulled the fabrics in these photos out of my stash, just as a first look at what I already have. The burgundy is a piece I bought back in the late 80s or early 90s - I love it, but have never known what to do with it. The three fabrics at the bottom of the photo just above also date from the same period. The shadow makes the one on the left look blue, but it is mainly green. A couple of more yellow-toned options appear in the photo below. And in both photos you can see a great fat 1/8 bundle of Japanese dobby fabrics that would fit right in. I'm looking forward to coming up with something interesting, although, to be fair, I think I am a bit of a fuddy duddy by nature. 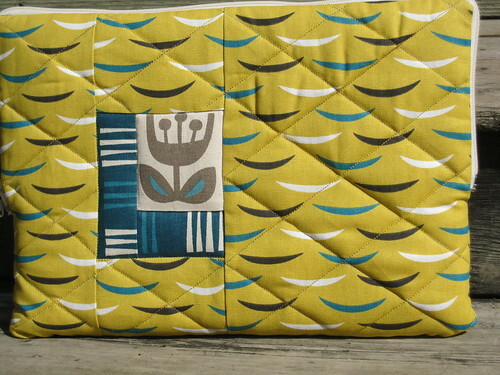 Or perhaps it is more accurate to simply say that I have a wide appreciation of aesthetic styles when it comes to quilts. It's going to be great to make a place at the table for green, burgundy and brown! Want to play? Cheryl is going to create a Flickr group for our creations soon - I will keep you posted! I am very very behind my time, given that I had initially set my deadline to be the end of June. My MIL's sudden passing put an end to that. 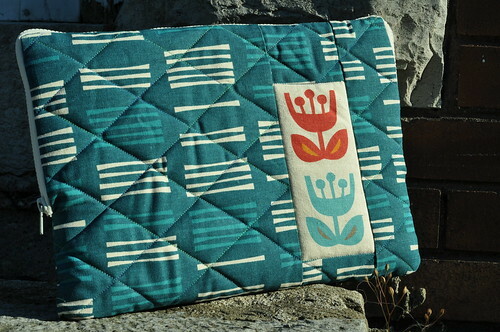 I am sorry that my first ever quiltalong should suffer from a grievous loss of leadership! 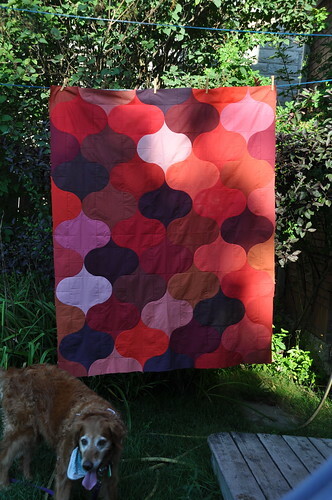 But at last, I have finished my ogee quilt top, done up in solids. I used the Hot Spice bundle of Kona solid FQs. I think this colourway is interesting - it doesn't quite do the same gradation of colour as some of the other Kona solid bundles that I've seen. 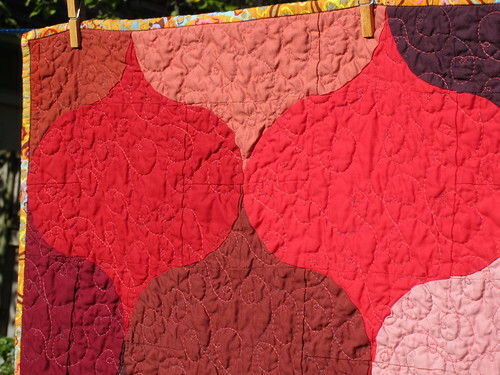 But I know this is going to work up really nicely once it's quilted. 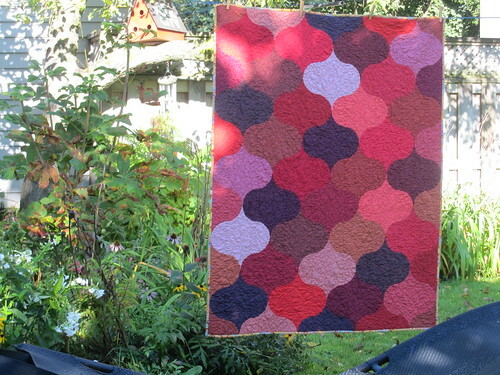 I'm looking forward to picking some variegated thread for the FMQ. You might remember that this quilt was commissioned by a friend for her daughter, who is going off to university next month. I am waiting for her to give me a little poem that I will work into the label on the back. I'm looking forward to being able to wrap this up so I can embark on a project that will be mine, all mine (insert wicked cackle here)! P. S. I couldn't pass up the opportunity to show you Susie at the bottom of this photo above!